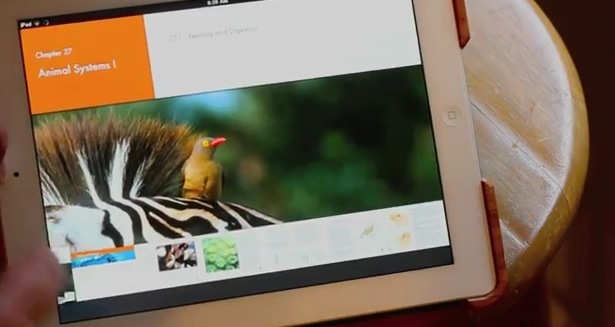 Today, Apple introduced a new breed of textbooks for the iPad. They’re interactive, with a bunch of cool multimedia elements that should make learning about topics insanely better than paper books. We took one of them, Pearson’s Biology, for a spin to see what the big deal was. We found the book to be delightful to use, with plenty of visual aids presented in an intuitive manner. The interactive points in the book were accessed with the common swipe, pinch and tap gestures universal to iPad interaction. Slideshows, videos and images are used in concert with multiple choice tests and highlighting ability to create a textbook that’s nothing like what I remember using. It’s clear that Apple has something pretty fantastic on its hands here and it should impress even the most jaded of educators. Now it’s just a matter of how to get iPads into the hands of the students that would benefit from these enhancements the most. Check out all of our posts from today’s Apple Education event here.